In February, STARcon 2018 was announced in this blog and elsewhere on the internet and social media as the first edition of a conference devoted to the technical and scientific aspects and topics surrounding Amateur radio. However, the preparations for this conference date back to late September 2017, when the organizing committee, formed by Luis Bernal EA5IDN, Gonzalo J. Carracedo EA1IYR, Alex Casanova EA5HJX, and myself, carefully started to think about how to launch this whole new project. A conference of this sort was completely unheard of in Spain, and we weren’t completely sure about whether this concept could work. Finally, this idea has become a reality. Around 70 people attended the conference and we have received very positive feedback from them. Our intention is to continue this line of work, establishing STARcon as an annual conference for the forthcoming years. 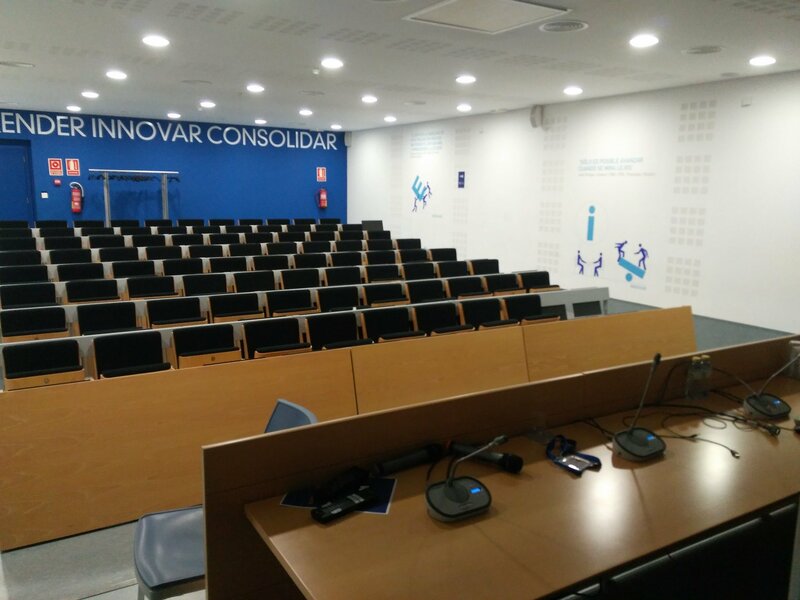 The conference took place in the Centro Europeo de Empresas e Innovación de Murcia (European Centre of Enterprises and Innovation in Murcia), which very kindly let us use a good part of their premises, including the large conference room, the canteen, and even the rooftop. 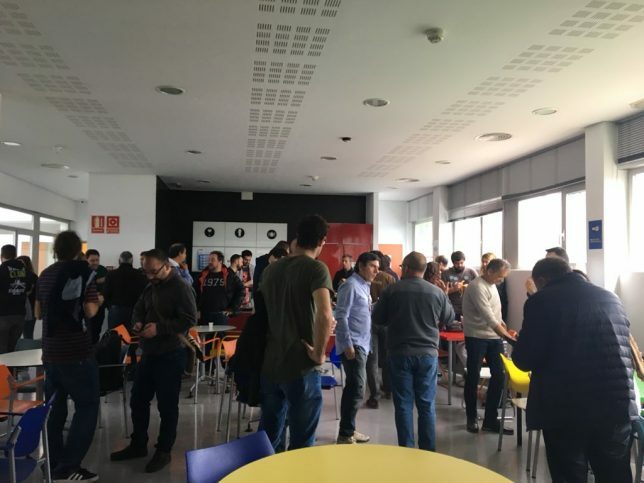 We counted with the support of Radio Club Errante, which helped a lot with the organization, and Murcia Lan Party, which organized amazing coffee breaks. Many thanks to all the people from these organizations. We made a book of abstracts (in Spanish) including the program, abstracts of the talks, general useful information and frequencies of local Amateur radio repeaters and the simplex FM 70cm working frequency for the conference. Dr. Manuel Prieto EA4FZR, from Universidad de Alcalá de Henares, gave the talk Antarctic communications, where he presented his expeditions to Antarctica to develop a communications solution to send scientific sensor data back to Spain nearly in real-time, rather than logging and storing the data in the sensors throughout the winter. He used a hybrid solution where data was first sent from the sensors to a central node via short range communications, then to the Spanish base by APRS on 2m, and finally to the internet by satellite. Pedro Olmos EA4EJR, from Universidad Pontificia de Comillas, gave the talk EASAT-2, where he talked about the state of the satellite EASAT-2, which is being developed by AMSAT-EA. This satellite is a 2P PocketQube carrying a linear transponder intended to be used with FM signals. 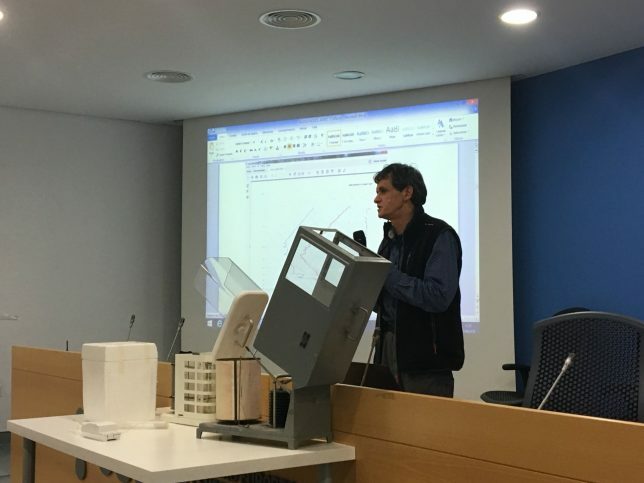 Julián J. Santamaría, from AEMET (the Spanish meteorological agency), gave a talk about Meteorological radiosondes. He explained the main meteorological variables and the sensors used to measure them, ranging from ancient times to the present, and how the data collected by radiosondes is interpreted. While this talk only touches radio tangentially, I consider it very important, as it served to introduce radio Amateurs to a very different and interesting scientific field. Julián also brought to the conference some ground-based sensors and radiosondes. Gonzalo J. Carracedo EA1IYR talked about Demodulating digital signals with suscan. He presented suscan, which is a software that he has developed from the ground up to analyse and demodulate PSK and FSK signals. I can assure you that this software is really useful to find quickly the parameters of an unknown signal. Iban Cardona EB3FRN gave the talk Amateur-DSN (Deep Space Network), where he presented the station he uses to receive interplanetary probes, and how it has evolved throughout the years. The main message of this talk was very encouraging: it is not as hard to do as it might sound, and it has become even easier in the last few years (due to improved PLL synthesizer ICs, for instance), so perhaps some other people might want to become involved in these activities. Tobias Wellnitz DH1TW talked about Shackbus – bringing IOT to your shack, where he presented his open source Shackbus system, which serves to interconnect, remotely control and automate all sorts of devices in the radio station, including rotors, antenna switches, amplifiers and transceivers. Shackbus uses a modular and distributed architecture and state-of-the-art concepts and protocols. Ricardo Saiz talked about his Analysis of the TDF/ANFR time signal in 162kHz. This is a very strong but relatively unknown LF time signal that uses FSK to transmit the data. Wikipedia has information about the format of this signal, but Ricardo found out that this information is not complete. He also used the signal to study LF propagation. I talked about my Ongoing projects and future ideas regarding Amateur satellites. Most of the material in the talk has already appeared in this blog: FT8 through linear transponders, using Stokes parameters to study polarization, and Amateur VLBI with LilacSat-2. Roberto Barrios gave a talked titled From theory to practice. He gave lots of very good advice on how to build do-it-yourself prototypes and perform srepairs, including SMD work, and how to assemble a basic electronics lab at home. He also talked about some of his personal projects, including a very long adventure repairing the LCD screen of a second-hand spectrum analyser. I find the ability and attention to detail in Roberto’s work impressive. For Sunday morning, some miscellaneous activities were programmed. The first of them was a live broadcast of El mundo en nuestra antena, a radio show about Amateur radio. Unfortunately, Arturo Vera EA5AYJ, the show host, couldn’t make it to the conference, so an informal colloquium with all the congress attendants was organized by Alex Casanova. 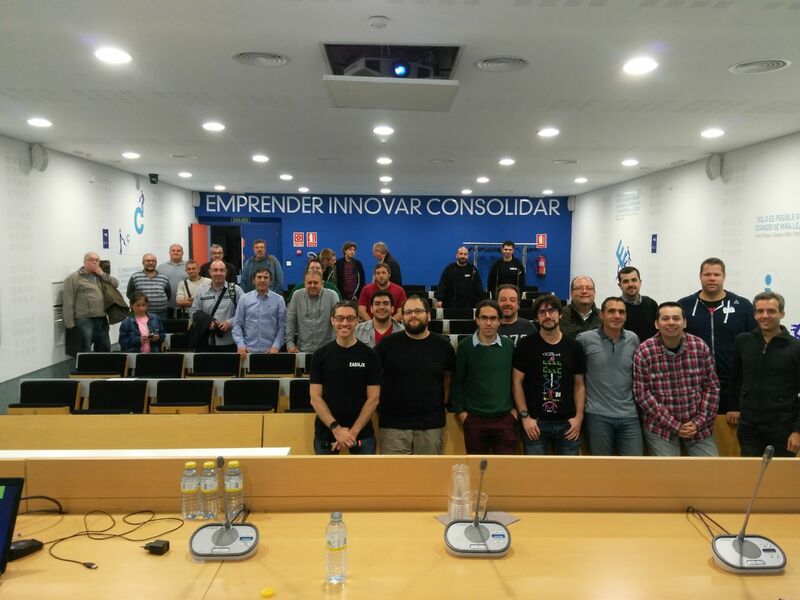 In this colloquium, the attendants exchanged impressions about the conference and discussed topics such as open-source, interoperable and state-of-the-art technologies in Amateur radio. 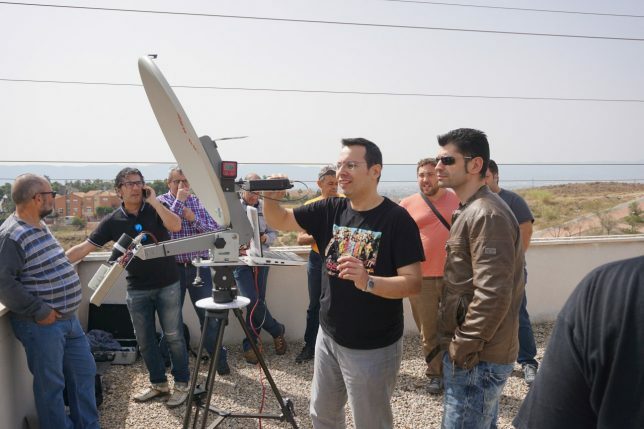 The second activity was a microwave demonstration organized by Iban Cardona, with the help of Maxi EA5CV. 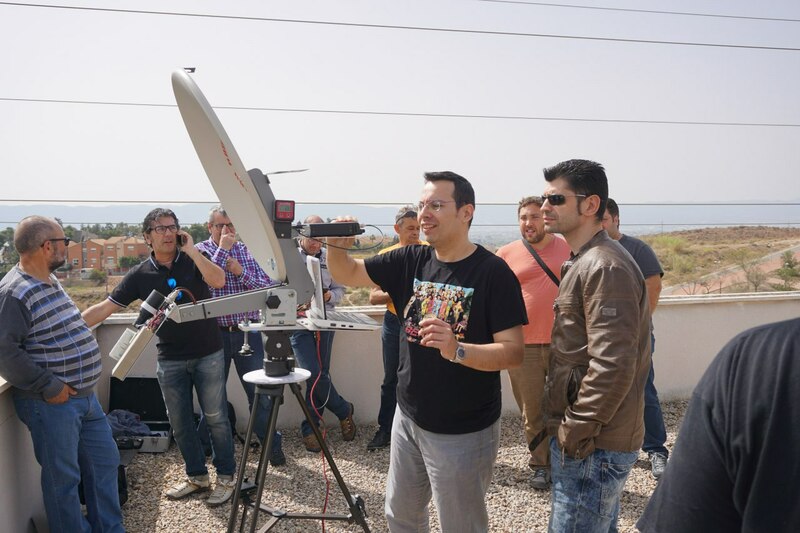 Iban installed his portable 10GHz station on the CEEIM rooftop and made a QSO with Luis Fernandez EA5DOM, who has a fixed station at his home in Benidorm. He also showed how to receive the beacon ED5YAF, which transmits CW and Opera. 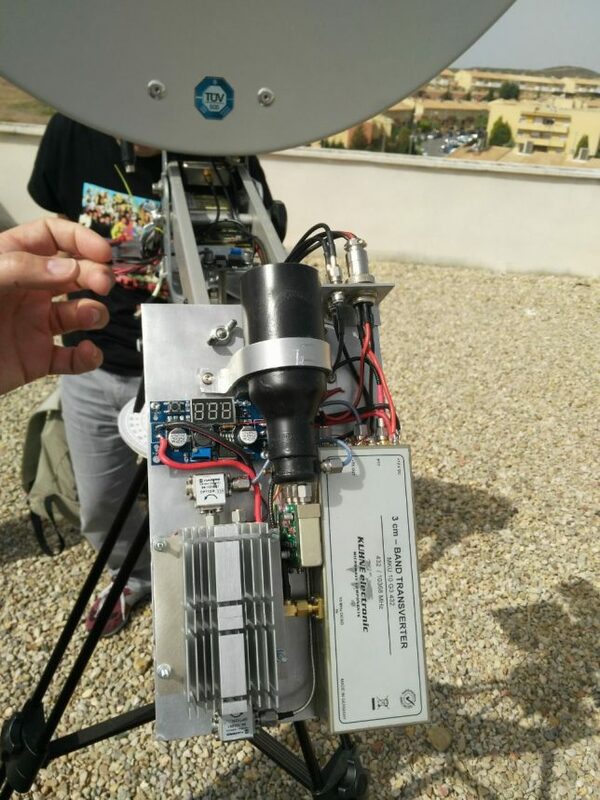 Iban’s portable station consists of a 60cm dish, a 10GHz transverter designed around the Kuhne transverter and an FT-817 as an IF radio. 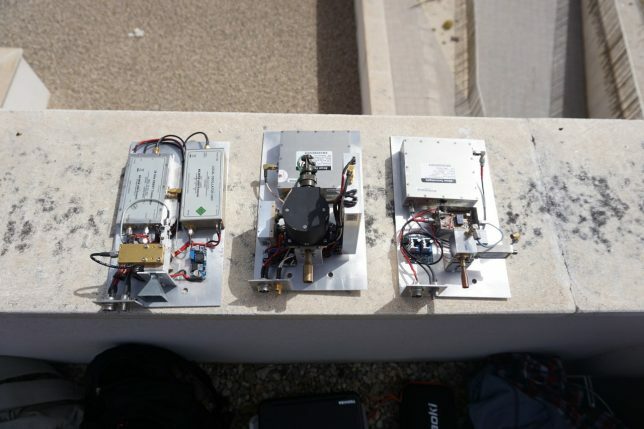 He also brought some transverters that he has built for the higher microwave bands. All of them are designed to be very easy to replace and install in his dish. The path for the QSO between EA5/EB3FRN and EA5DOM was completely non-line-of-sight. Iban was confident that the contact would be possible, but even him was surprised by the strength of the signals. The QSO was made in FM mode and the signals were very strong. The audio was fully quieting except for some occasional fading. As one can see in the figures below, there were several high mountains in the propagation path, and Iban used 3º of elevation to improve diffraction over some nearby mountain ridges. 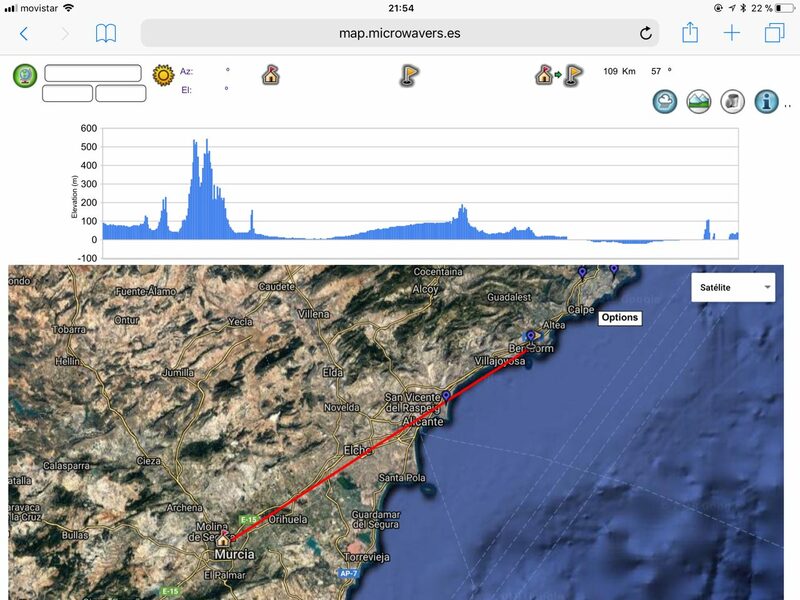 The distance of the QSO was 110km. The beacon ED5YAF (which incidentally appeared in this blog a couple years ago) also had good signals. With this demonstration, Iban was able to show that microwaves can be easier than what one may think (very much in line with the idea of his talk about Amateur DSN). Hopefully this kind of demonstrations will encourage more people to start playing on the microwave bands. 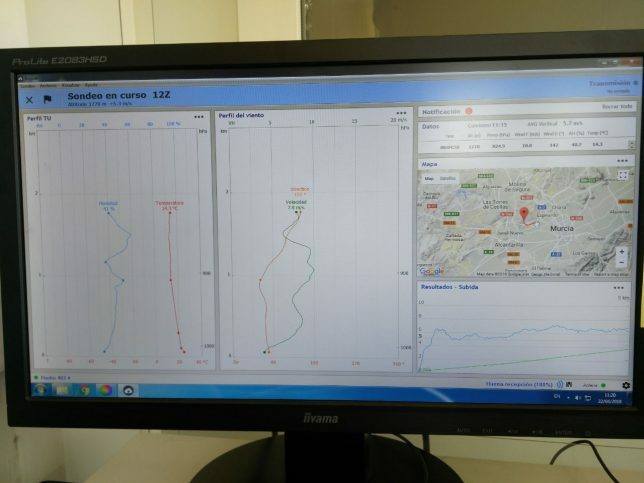 The third and last activity of the morning was a visit to the meteorological centre in Murcia. This was organized by Julián J. Santamaría in collaboration with the personnel of the centre. 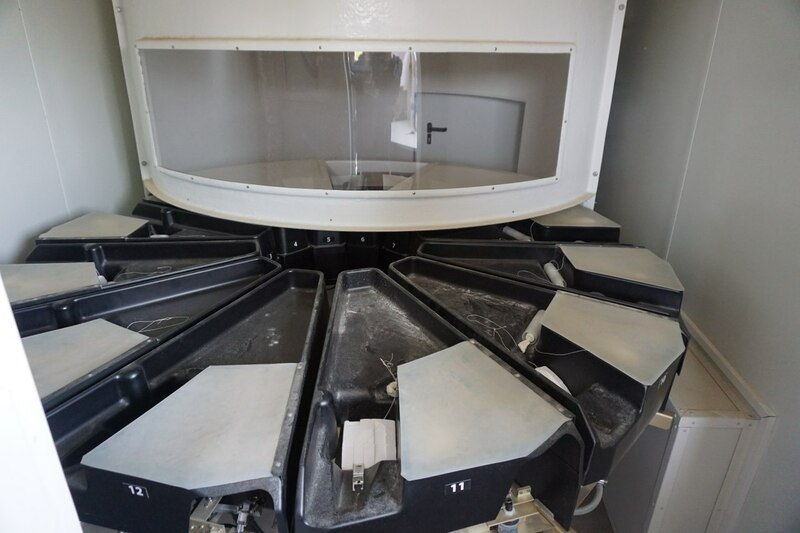 The main goal of the visit was to see the launch of the radiosonde, which is a fully automatic process that starts around 13:00 local time and ends at 13:15, when the radiosonde is released. The radiosonde launched in Murcia is a Metemodem M10, which is a cheaper design than the Vaisala RS41 which is launched in Madrid. 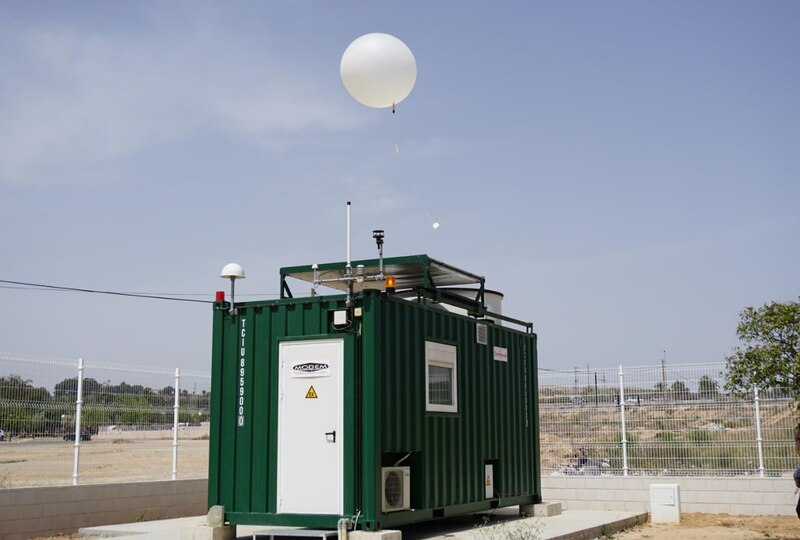 All the handling, calibration and launch of the radiosondes is made from a small prefab building called Robotsonde, seen in the figure above. The preparation, calibration and placement of the sondes in the carousel of the Robotsonde is a manual process. However, the launch, including radiosonde boot up, balloon inflation, and release is fully automated and no one is allowed to be inside the Robotsonde building during this process. 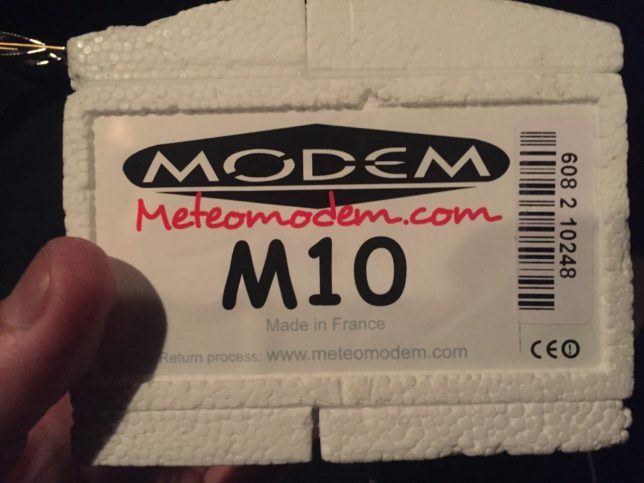 The radiosonde is received and monitored inside the main building of the meteorological centre. 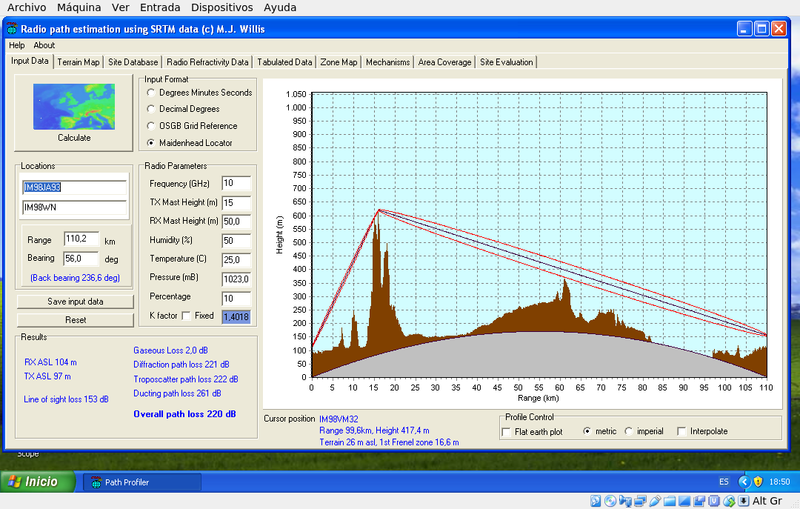 Some software running on a PC shows the position of the radiosonde and the meteorological variables in real-time. 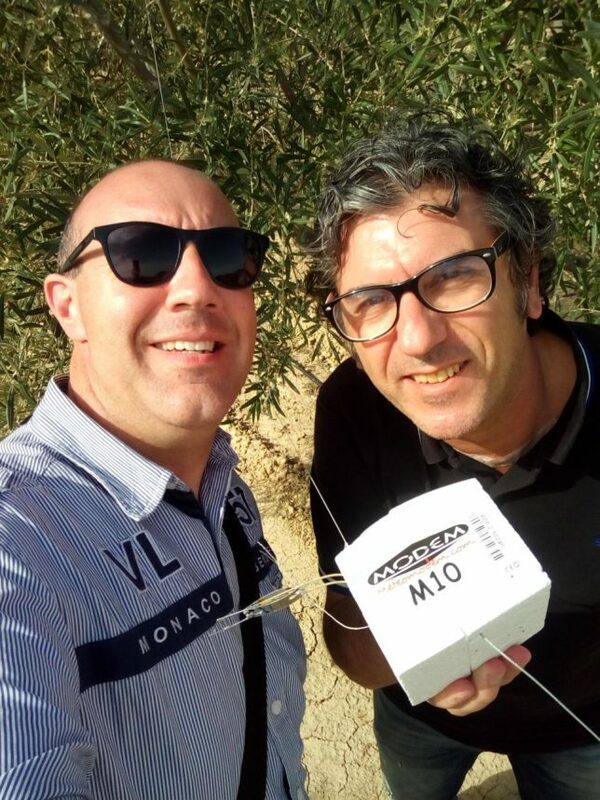 The same radiosonde that we saw being launched was recovered later in the afternoon by José Luis EA5IOT and Maxi EA5CV on their trip back home. After the activities, the attendants gathered at the CEEIM canteen for the closing lunch. This was an informal pizza lunch to encourage conversation between the participants. One of these conversations revolved around the IF noise meter designed and built by José Luis EA5IOT, who brought one prototype to the conference and showed it over the lunch. Thes meter is designed to measure the noise at the 144MHz IF of a microwave transverter, which is very helpful for measuring sun noise, tracking the sun, and so on. The design is simple and inexpensive, but it seems to work very well. It uses a mixer (the SA612, if I recall correctly) that mixes 144MHz down to 10.7MHz, and then uses standard IF filters to get a noise bandwidth of around 300kHz. Then power is measured. An ARM microcontroller does all the calculations and drives an LCD that shows the averaged measures and a historical graph. 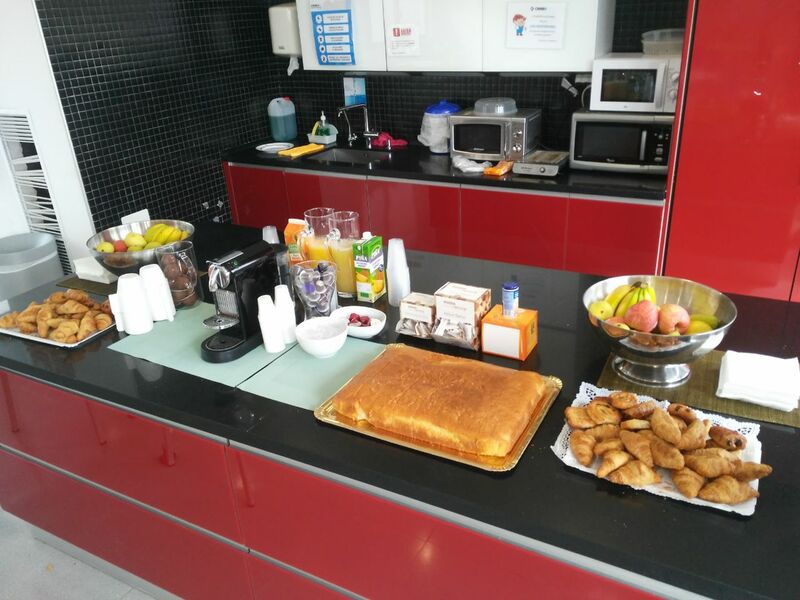 We are very satisfied to see how well the STARcon conference has worked. 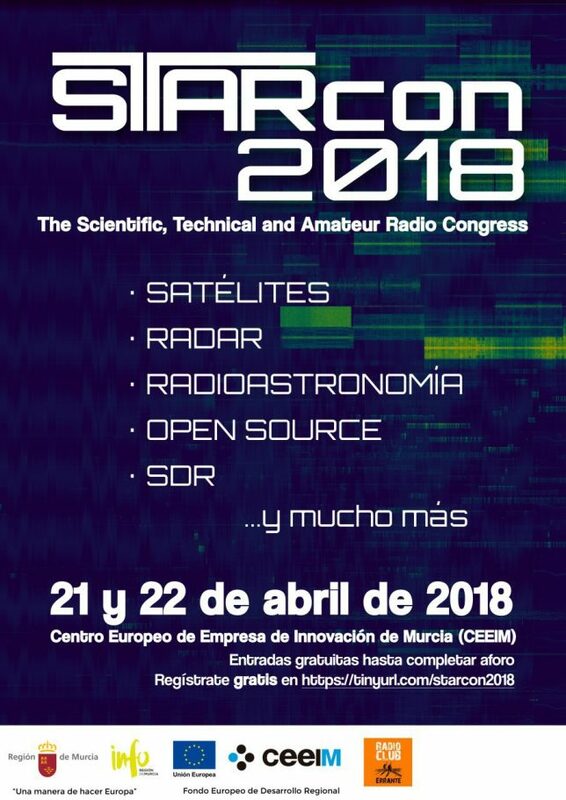 Going back home, Gonzalo and I were already thinking about how to organize the second edition next year and to try to establish STARcon as an annual conference: the reference for all scientific and technical endeavours in Amateur radio and related fields in Spain. 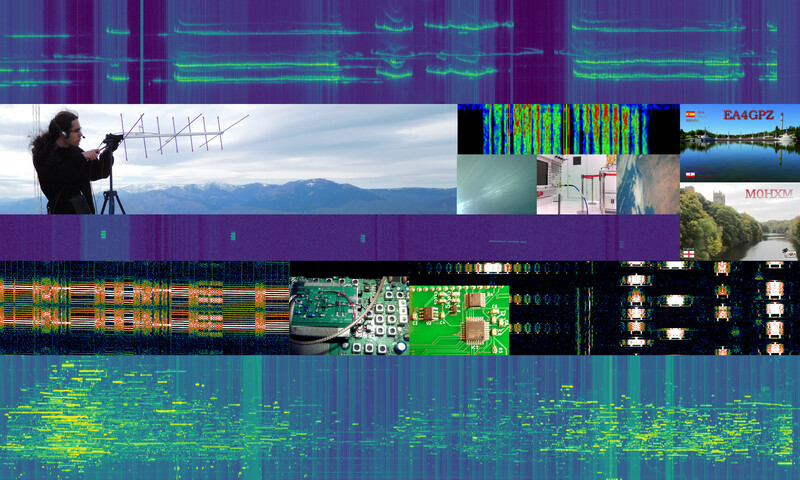 This is a conference from radio Amateurs for radio Amateurs, and all of us (attendants, speakers and organizers) make it possible, so we are open to all sorts of proposals.